Address: 31900 S. Las Vegas Blvd. 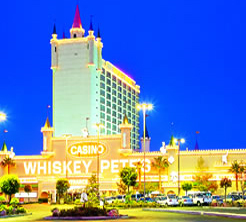 Known as the 'Castle in the Desert', Whiskey Pete's is located along the 1-15, approximately 48 miles out of Vegas. 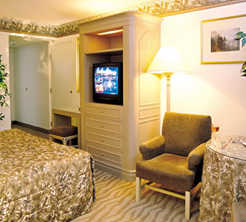 The Western-themed resort boasts two castle towers holding 777 rooms and suites. Enjoy headliner entertainment in the showroom or dine in any of several great restaurants, including the acclaimed Silver Spur Steakhouse. As the first hotel-casino California visitors pass on their way to Las Vegas, it is always a welcome sight. The 36,400-square-foot, casino and 700-seat showroom plays host to many of today's and yesterday's stars. 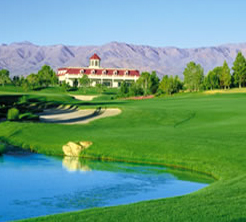 And there is even a free shuttle service to Whiskey Pete's sister resorts: Primm Valley Resort and Buffalo Bill's.